Looks delicious! The recipe is almost identical to my grandmother's recipe. I think I may have to make them for my father's day brunch menu! 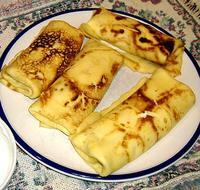 Take a look at www.crepinicafe.com We make delicious crepes, which we call crepini with a variety of fillings and they get they delivered to your door. Great! Just got a fresh dozen eggs! This one's heading the menu for Sunday!